The new rain date for the World Series will be next weekend, October 21st-23rd. 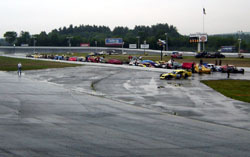 Also cancelled for this weekend was the Longjohn 150 Pro Stock (Super Late Model) race at Maine’s Unity Raceway. It has been rescheduled for Saturday, October 29th. These cancellations come on the heels of last weekend, when the Twin 100s at Thompson for the Busch North Series and Modified Tour were washed out and rescheduled for October 29th. The changes at Thompson will have a domino effect on short tracks throughout the region. Next weekend, the World Series will now run directly opposite of two other major open competition shows, Octoberfest at Lee USA Speedway (NH) and the PASS-sanctioned Fall Final at Canaan Fair Speedway (NH). Octoberfest and the World Series have traditionally drawn a healthy field of competitors from all over the Northeast at a time when most tracks have shut down for the year. The Fall Final at Canaan is the new kid on the block this season. With only a limited pool of race teams out there, the car count at all three venues will likely suffer thanks to Mother Nature. 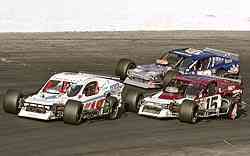 The 2005 NASCAR Busch North and Whelen Modified Tour seasons were both supposed to be in the books by tonight. Champions were to have been crowned and select teams would not be looking forward to prestigious post-season events such as the Toyota All-Star Showdown at California’s Irwindale Speedway [for Busch North] or the North vs. South Shootout at North Carolina’s Concord Motorsport Park [for the Modifieds]. Instead, both series won’t finish out their years until at least the end of October. The culprit? Heavy rains that have plagued the Northeast for the past eight days. This weekend’s World Series at Thompson International Speedway, which includes a 150-lap Modified Tour race, is the latest victim of the weather. All week long, track officials remained optimistic about adjusting this weekend’s schedule made up of 14 classes of racing to still get the event in the books. Teams were allowed to sign into the pits and unload their haulers on Friday. Later in the evening though, heavy rains flooded the track and pit areas, forcing an outright cancellation of the entire weekend. Much of Thompson's track surface was underwater, and not being used for racing like this, over the weekend. Waterford Speedbowl, a track located near Thompson that has many competitors in common, has had to rework their schedules. Their season finale, with several class championships up for grabs, was rained out last weekend and rescheduled for October 22nd-23rd. However, with the World Series being moved to that date, Waterford has pushed back the race one more weekend to October 29th-30th. including a man killed in Stafford, Connecticut (the hometown of Stafford Motor Speedway) when his truck was washed away by floodwaters at a campground. Speed51.com will keep you up to date with the big shows in the Northeast that will finish out the year. We plan to be at Thompson for the next two weekends to tell you who wins the Busch North and Modified championships and how they pulled it off coming down the homestretch. That is, unless it rains.